OK, I said a while back I was going to start posting stories and stuff related to my writing. Have I done it? No, not at all. Sooooo, better late than never, right? And here's one of the pics that ran with it. 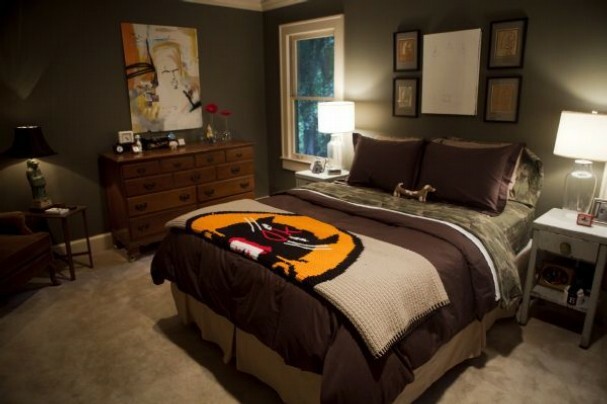 This is his master bedroom, and the main items to note are the afghan folded over the end of the bed (its significance is mentioned in the story) and the original art on every wall. A lot to learn here for anybody who calls him/herself a collector. Nice article. I love the guys home. I think that is a similar style to what my wife and I are trying to do with our home. I love the mix of modern and vintage, and the fact that everything from the throw, to the night stands to the branch of hanging on the wall are interesting to me. Good stuff! Hi Stacey. I can't find your e-mail anywhere. Would you mind getting in touch with me? I want to respond to the comments you left on my blog. Stacey! You are Super Woman and I totally dig your style writing, weekly features in the Commercial Appeal, your zest for life and your fearless ambition to accomplish everything in life! To that accord, I would like to help you to boost an aspect of your long list of current duties/aspirations further!! My name is Bonnie Bird, and I would love for you to email me at your earliest convenience for me to fill you in! My email address is bnbird@gmail.com. Can't wait to hear from you!!! Thank you, thank you! !